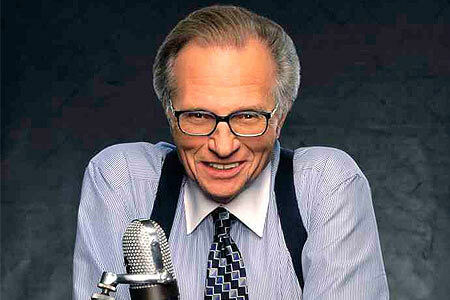 Home > Media	> Farewell, Larry King! Announcing his retirement via twitter by saying he was going to “hang up his suspenders” this fall, the end of an era is finally at hand. Though it wasn’t pretty at the end as over 40% of his audience pretty much disappeared (actually, they died), he leaves a considerable legacy and a tremendous body of work. Could it be – and I swear to you I am not exaggerating here- that his audience is dying? Literally keeling over? I mean 2.4 million Americans die every year. In his key 65-74 demographic, about 400,000 people can be expected to lose their lives on an annual basis. Since last year, King has lost about 570,000 viewers. But all that doesn’t really have as much to do with Larry himself as it does with the folks at CNN who stubbornly refused to put his show to rest. I suppose it would be hard to blame them considering Larry held that cable network up for decades, raking in hundreds of millions in revenues. The “debate” he moderated via his show between Vice President Al Gore and Ross Perot in January of 1993 remains the single most watched program in cable history. The list of celebs, politicians, luminaries and victims of scandal who have graced his set reads like a who’s who list of the 20th century. My own connection with Larry dates back to the mid 1990’s when I came to CNN to run their radio network. Westwood One’s radio simulcast of Larry’s TV show hit my revenue line and the graph of his radio revenues was an upside down hockey stick; not good. Working with my buddies at Westwood we tried and tried in vain to get Larry to remember that his contract still included this radio simulcast and that maybe he could cut down on the visual references. The big highlight in that regard was the night during the OJ Simpson murder trial when Larry had a polygraph expert on to determine the veracity of the testimony of Detective Mark Fuhrman. It was an entire hour of looking at spikes and valleys on polygraph charts featuring such scintillating phrases as, “Wow, look at the spike there, you think that means he was lying?” This made for tremendously underwhelming radio, to say the least. The Westwood folks did their best to replace those shows with more radio-friendly evergreens but it was ultimately a losing battle. It was almost as if Larry was purposely leaving the radio part of his life behind with every “watch this clip,” he uttered on his TV show. I remember this very issue escalated into a knock-down-drag-out between me and Wendy Walker Whitworth, Larry’s long-time Executive Producer. The venerable, then Senior CNN Vice President, Gail Evans, intervened to bring peace to the family. The issue was quickly resolved. Larry got his way and I gave up getting him to acknowledge he still had a radio audience. He did great radio. That’s how he got the TV gig, remember? It helps explain the large radio microphone on his desk. Larry’s overnight show on the Mutual Radio network was really good. I’ll always remember the night John Lennon was shot. I was doing morning-drive newscasts then for a local Washington radio station so I always listened to Larry’s radio show on the way in to work. The program that morning was complete and poignant and totally did justice to the importance of that moment in our lives- I’ll never forget it. As a TV talk show host, Larry was often ridiculed for throwing softball questions at his guests. I always thought that criticism was unfair. He never pretended to be Edward R. Murrow (Murrow actually did his share of soft celebrity interviews in his time). Larry asked the questions your average folks sitting on the couch watching the show would ask. I would argue that was his appeal in the first place. He was the “everyman” of interviewers. There will be many tributes to Larry King in the weeks ahead and he richly deserves all the kudos he gets for becoming an American icon and mastering his particular style of interviewing. He became a part of our national consciousness. We should be grateful to CNN and to Larry for finally figuring out that his exit was necessary and inevitable. And we should be grateful to Larry for gracing our living rooms for so many years- back when people still watched live TV in their living rooms.